Putrajaya's Anti-Fake News Bill 2018 has proposed a hefty penalty - up to RM500,000 fine or up to 10 years' jail, or both - for those found guilty of spreading "fake news". The bill defines "fake news" as "any news, information, data and reports, which is or are wholly or partly false, whether in the form of features, visuals or audio recordings or in any other form capable of suggesting words or ideas". The same hefty penalties also apply those who provide financial assistance or abet the production of "fake news". 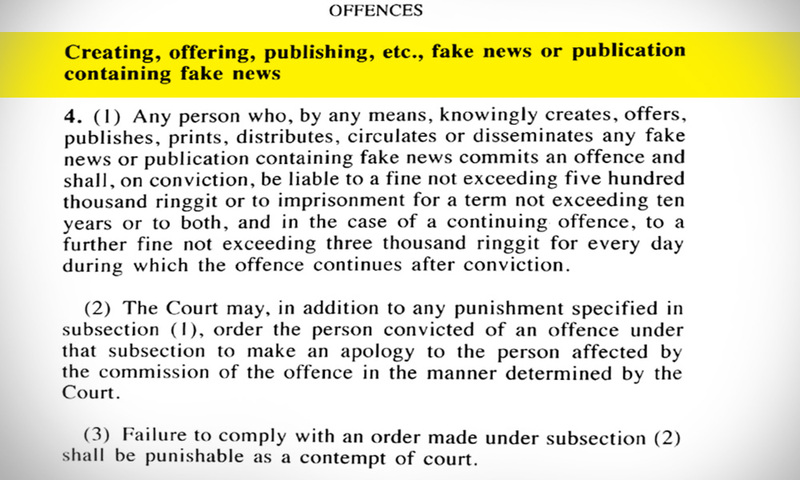 Section 6 of the bill stipulates that publishers have the obligation to immediately remove "fake news" after "knowing or having reasonable grounds to believe that such publication contains fake news". The bill also prescribes extra-territorial application to both foreigners and Malaysian citizens, as long as the content involved Malaysia. The proposed law also includes provisions to allow for the application of a court order, on an ex-parte basis, for the removal of materials deemed to be "fake news". Failure to comply will result in a maximum fine of RM100,000. Although there are provisions to challenge this order in court, Section 8 (3) of the bill states that no appeal can be made if the government obtains the order on the grounds of national security. "If an order… is obtained by the government relating to a publication containing fake news which is prejudicial or likely to be prejudicial to public order or national security, there shall be no application for the setting aside of such order by the person against whom the order was made." Section 13 indicates that if a company commits an offence under this law, the director, chief executive officer, manager, secretary or other similar officers shall be liable for an offence as well. The bill was tabled in the Dewan Rakyat today by Minister in the Prime Minster’s Department Azalina Othman Said for its first reading. The Dewan Rakyat’s order paper states that the Anti-Fake News Bill and several other government bills will be taken through all three stages - the first, second and third readings - of the legislative process during the current meeting, which would conclude on April 5. Other bills presented for its first reading today are the Arbitration (Amendment) (No 2) Bill 2018, Civil Law (Amendment) Bill 2018, Limitation (Amendment) Bill 2018, and Malaysian Anti-Corruption Commission (Amendment) Bill 2018.